This routine will activate all of your vital organs, center your mind, and improve your overall health in just 10 minutes a day! 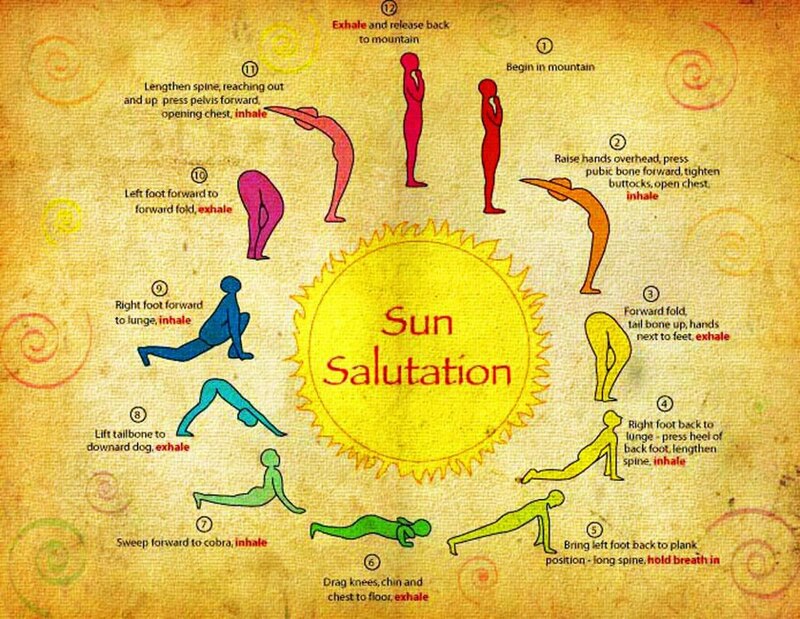 (Surya Namaskara) is a sequence of twelve positions performed in a continuous flow. Each position counteracts the one before, stretching the entire body, while alternately expanding and contracting the chest to regulate the breathing. These powerful yoga poses are said to have a great impact on the whole body, and mind. Sun Salutation is best done at sunrise in a space that will allow you to soak up the sun’s rays. It only takes 5-15 minutes to complete depending on how many sets you choose do. It stretches literally every part of your body making you much more flexible and limber. Burns calories, while helping you gain strength and stamina. Stimulates thyroid glands, and improves hormonal secretions. Tones up digestive system by stretching and compressing abdominal muscles. Clear your mind, and start the day centered and relaxed. Feel more connected to the sun and grateful for its gifts. It’s the equivalent of 288 yoga poses in 15 minutes! The Sun Salutation can be a relaxing stretch, or an invigorating cardio-workout; You decide! Watch this video for simple instructions on how to properly perform the Sun Salutation. For beginners, and those wanting a easy morning stretch doing these postures at a slow pace will tone muscles, while being relaxing and meditative. This also allows you to enjoy the stretch and makes the body more flexible. For those wanting to get a good cardio workout, Performing 12 sets at a fast pace will burn calories and help you work up a sweat. One round consists of 12 poses, one set consists of two rounds: first stretching the right side and then the left side. BHUTKAR, M., BHUTKAR, P., TAWARE, G., SURDI, A.. How Effective Is Sun Salutation in Improving Muscle Strength, General Body Endurance and Body Composition?. Asian Journal of Sports Medicine, Tehran, Iran, 2, dec. 2011. Available at: <http://asjsm.tums.ac.ir/index.php/asjsm/article/view/127>. Date accessed: 09 Apr. 2015.